10-01-2015 20:55 It's now clouded over so we are packing up the telescopes. We still have the talks and displays indoors. The weather forecast for tomorrow is also poor, so we will probably just be inside again. 10-01-2015 19:45 There are telescopes set up on the tennis courts looking at the new Comet Lovejoy's, the Pleiades, the Orion Nebula etc. Wrap up warm - it's chilly! 10-01-2015 16:00 As expected, last night was much too windy an cloudy to be outside observing. This meant that we could have a good selection of telescopes indoors to show our visitors along with the presentations and talks. It'll still be cold and rather breezy, though, so wrap up well and bring a torch (we can provide red film at the information desk so that you keep your night vision). The bar will be open to purchase hot food and drinks but the actual event is free. 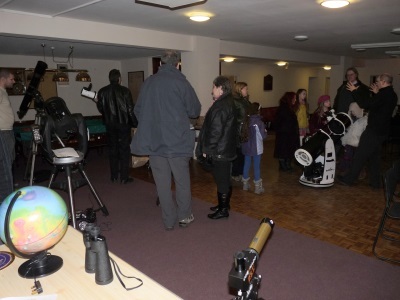 Early in 2015 we are holding our usual weekend outreach event at Henley Golf and Country Club in conjunction with the BBC's Stargazing Live theme. The arrangements are somewhat different to last year in that the actual BBC programmes will be shown later in March around the date of the total solar eclipse on March 20th 2015 (partial for the UK). Normally, we would try and arrange the weekend to coincide closely with the programmes on television. However, this is not possible as the venue is not available around this date so we are holding the event in January as per usual. In the event of cloudy skies we shall use the club house to show you videos, telescopes and discuss topics of Astronomy and Cosmology. As in previous years we will be running a free public "Star Party". This will include a range of interesting activities for people of all ages, each evening from Friday 9th to Sunday 11th January from 6:30pm to around 10:00pm. This will be an opportunity for you, your friends, children, to see planets, moons and galaxies as well as to learn about astronomy and telescopes. On our chosen dates astronomical twilight (when the sky is dark enough to observe fainter objects) begins not long after 18:15 GMT so visitors should be able to look through telescopes in the early evening. This will be helpful to those with young children with early bedtimes. If we had chosen dates in March then astronomical twilight is much later at 20:15 GMT. Of course any observing will only be possible if the British weather behaves! We are also extremely grateful to the hospitality shown us by the staff and management of Henley Golf and Country Club. They were tremendously helpful in making last year’s weekend a success. The photo on the right shows some of the telescopes we have had on display previously. There will be experts available to help visitors with advice about astronomy, telescopes and any other questions visitors may have. We also plan to have indoor briefing sessions to brief people about what can be observed that night, so as to make their skywatching more effective when they go outside. More details of the 2015 event will become available week by week and we will "spread the word" online via this site, Facebook and Twitter, so please keep an eye on our news.